Direct mail can be a lucrative area for a business, but the key to success is in profitable advertising campaigns. In order to determine whether a campaign was a success is with a direct mail ROI or direct mail return on investment figure. Download the template here. Taking the total sales for a particular advertising effort, and dividing it by the total expenses that relate directly to this advertising campaign calculate a direct mail ROI number. Naturally any positive number for direct mail return on investment means that the advertising was a success and a negative number for direct mail return on investment indicates failure. A direct mail ROI calculator in the form a spreadsheet is the best way to determine an accurate direct mail ROI percentage. 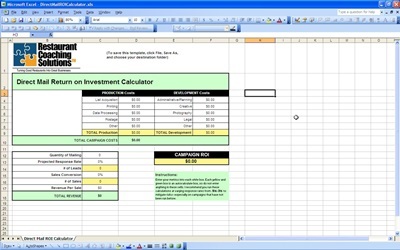 A spreadsheet allows you to keep track of every expense related to the advertising. It is easy to simply list the descriptions in cells formatted for text and then the dollar amounts in adjacent cells. You can then create a formula to calculate direct mail ROI. Using an Excel template, the spreadsheet is already formatted as a direct mail ROI calculator and it is only a matter of entering in your business expenses. Everything is already programmed for you. With a spreadsheet programmed as a direct mail ROI calculator, you will have a powerful analysis tool. You will be able to determine quickly which type of advertising is working best for the direct mail return on investment for your product. The greatest part of using an Excel template for a direct mail ROI calculator, is that it is free. You can decide yourself is this type of direct mail ROI calculator is best for you at no cost. They can be downloaded at no charge as well as a wide range of other spreadsheet templates for business or personal use.